The future is formed out of constantly developing, waving probabilities[i]. It is not a place on the 4-D Universe graph you can get to in a machine. It doesn’t exist; it isn’t there; it hasn’t happened yet. From the beginning of the world, God has a plan. He knows what He will do. Daily He works toward His goal[ii]. Jesus was working toward that goal too. Jesus said that he did what he saw the Father doing[iii]. Humans may also work against God and His plan, but that doesn’t stop God from working toward His goal. with a set of constantly developing, waving probabilities. Probability is the key word. The daily works of God “collapse the wavefunctions[v]” of probabilities onto each probability that progresses His plan. Whatever things human choices may throw into the way to divert God’s plan, God will daily move toward His goal. As we live and pray daily, “Thy kingdom come; Thy will be done,” we are paving the road toward God’s goal out of the material of today’s probabilities. The six day creation story illustrates God building the mechanism of the Universe. At the end of the sixth day all the parts are in place. On the seventh day, God, like a clockmaker winding his clock for the first time, releases the mechanism of His creation. He rests while he enjoys watching every sub-atomic movement producing larger and larger movements as the clockwork of the Universe begins unwinding. 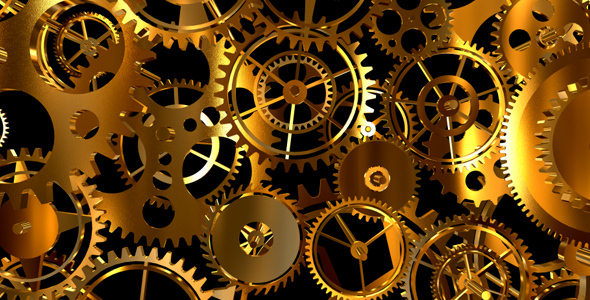 Unlike the predictability of clockwork mechanisms, the Universe incorporates free will. Human choices affect outcomes. Maybe animal choices affect outcomes. Maybe spirit beings affect outcomes. All of these effects produce the constantly developing wavefunction of probabilities that God uses as materials to pave the road toward His goal. Known unto God are all His works from the beginning of the world. The Universal Creator daily finds a way toward His goal among the constantly developing probabilities. He invites us to join Him in that work as Jesus did[iv]. That takes faith. That is faith. [iii] John 5:19 Then answered Jesus and said unto them, Verily, verily, I say unto you, The Son can do nothing of himself, but what he seeth the Father do: for what things soever he doeth, these also doeth the Son likewise. [iv] John 14:12 Verily, verily, I say unto you, He that believeth on me, the works that I do shall he do also; and greater works than these shall he do; because I go unto my Father.